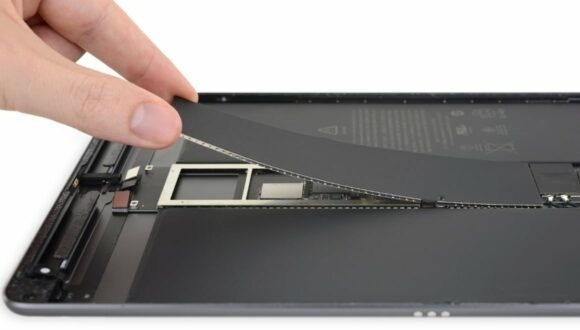 It was only a matter of time until the people of iFixit took the new iPad Air 2019 apart bit by bit. Earlier we already saw an AirPods 2019 teardown passing by and the iPad mini 2019 also has a teardown . Now it's the turn of the iPad Air. First of all, it is striking that the Air as a powerful mid-sized car has taken over some of the features of the iPad Pro 2017 . The tablet also has a Smart Connector and a 10.5-inch screen. The iPad Air 2 from 2014 had to do with a 9.7 inch display. Inside, too, we see many similarities with the slightly older Pro, such as a chip that makes Apple Pencil support possible. In addition, the iPad Air 2019 has a larger battery than its predecessor. Furthermore, there are two speakers built-in, but the 8-megapixel camera has remained the same. Just like in the iPad mini 2019 , Apple's A12 Bionic chip can be found in the tablet. Although many parts are modular and relatively easy to replace, the iPad Air 2019 still gets a reparability score of 2 out of 10. The Lightning port is soldered to the motherboard and therefore difficult to replace. Something simple like replacing the battery is also difficult, partly due to the large amount of cables and glue. The iPad Air (2019) has a suggested retail price of 569 euros for the 64GB version. For the variant with 256GB of storage space, a suggested retail price of 739 euros applies. The new iPad Air is available at various Dutch web stores . Are you still not sure which iPad suits you best? For such cases, we have listed all 2019 iPads .